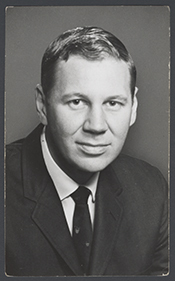 FREY, Louis, Jr., a Representative from Florida; born in Rutherford, Bergen County, N.J., January 11, 1934; graduated from Rutherford High School, Rutherford, N.Y., 1951; B.A., Colgate University, Hamilton, N.Y, 1955; United States Navy, naval aviation, 1955-1958; United States Naval Reserve, 1958-1978; J.D., University of Michigan Law School, Ann Arbor, Mich.,1961; admitted to Florida bar, 1961; lawyer, private practice; assistant county solicitor until 1963; associate, and partner, law firm of Gurney, Skolfield &Frey, Winter Park, Fla., 1963-1967; acting general counsel, Florida State Turnpike Authority, 1966-1967; partner, law firm of Mateer, Frey, Young & Harbert, Orlando Fla., 1967; chairman, Florida Federation of Young Republicans; elected as a Republican to the Ninety-first and to the four succeeding Congresses (January 3, 1969-January 3, 1979); was not a candidate for reelection to the Ninety-sixth Congress in 1978, but was an unsuccessful candidate for the Republican nomination for Governor of Florida; unsuccessful candidate for Republican nomination to the United States Senate in 1980; is a resident of Winter Park, Fla.
Frey, Lou, Jr., and Aubrey Jewett, eds. Political Rules of the Road: Representatives, Senators, and Presidents Share their Rules for Success in Congress, Politics, and Life. Lanham, MD: University Press of America, 2009.